Congrats Raisa C. of Daly City, CA! 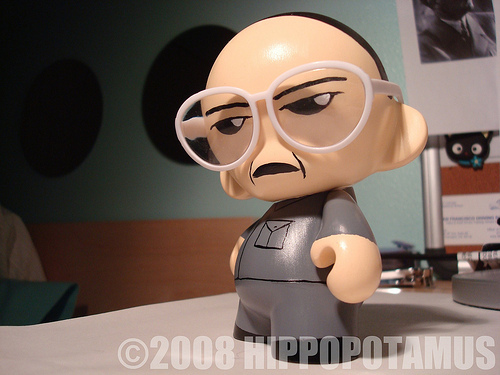 You’re the featured MUNNYWORLD contributor of the week and the winner of a free MUNNYWORLD character! Kim Jong Il is small but feisty. Whatever you do, don’t draw attention to his height. MUNNY’s new friends, TRIKKY, BUB, RAFFY and ROOZ want to be as famous as MUNNY. The new MUNNYWORLD characters have some catching up to do! Get your hands on a new MUNNYWORLD character, customize it and upload it to our new MUNNYWORLD Flickr group to show the world! Every Wednesday, we randomly award a MUNNYWORLD figure to a lucky toymaker and feature it on the KRonikle! So get your MUNNYWORLD and get crackin, you can do anything you want! Post your MUNNYWORLD creation today for a chance to win!